General Austin S. Miller, commander of U.S. and NATO forces in Afghanitan, met with Pakistan army chief, General Qamar Javed Bajwa, in the garrision city of Rawalpindi on Dec. 27, 2018. The U.S. commander of foreign forces in Afghanistan traveled to Pakistan Thursday to discuss Afghan reconciliation efforts with Pakistan's military chief, officials said. Gen. Austin Scott Miller’s visit came amid reports of a possible U.S. troop drawdown in Afghanistan and a renewed push to negotiate peace with Taliban insurgents for ending the 17-year-old Afghan war. An army announcement said Pakistani General Qamar Javed Bajwa told Miller that Islamabad is committed to Afghan peace efforts. “Both expressed unanimity of views on importance of political resolution of [the] Afghan situation and underlined that only an Afghan-owned and Afghan-led inclusive process can lead to peace in Afghanistan,” the statement noted. Pakistan, which is accused of sheltering Afghan Taliban leaders, took credit for organizing two-day direct “peace talks” between U.S. and insurgent officials earlier in December in the United Arab Emirates. Representatives of Saudi Arabia, Pakistan and the host country were also in attendance. The Taliban says its representatives at the negotiating table sought “a date or timeline” from U.S. interlocutors for a complete withdrawal of international forces from Afghanistan, citing their presence is the “biggest obstacle” in the way of peace. FILE - A U.S. armored vehicle patrols in Kabul, Afghanistan, Aug. 23, 2017. 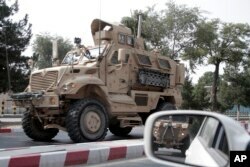 It is not clear whether U.S. President Donald Trump’s reported orders for pulling out half of the more than 14,000 U.S. troops in Afghanistan stemmed from the meeting in Abu Dhabi and officials in Washington have not confirmed reports of the potential drawdown. The Taliban and Zalmay Khalilzad, the leader of the U.S. negotiating team, have both described their discussions in the UAE as “productive," and pledged to meet again soon at the same venue. The dialogue is said to be aimed at seeking direct talks between the Taliban and the Washington-backed government in Kabul. The insurgent group, however, continues to reject calls for engaging in negotiations with Afghan envoys. The group dismisses the Afghan government as puppets installed by the U.S. and considers Washington as its main adversary in the conflict. Also Thursday, the Taliban demanded the U.S. withdraw from Afghanistan. The renewed demand was made following the anniversary of the 1979 military invasion of Afghanistan by the-then Soviet Union. The insurgent group claimed U.S.-led foreign forces are “facing the exact same fate” that Soviet troops suffered in the shape of a forced withdrawal. “It [Taliban] advises the American invaders to adopt rational and understanding by withdrawing from Afghanistan and maintaining any future relations based on sound diplomatic and economic principles instead of testing might,” the insurgent statement said. The reported withdrawal plans have worried Afghan military officials, prompting Gen. Miller earlier this week to assure them of continued U.S. support. “You have seen the same rumors I have, from the newspapers, but all I would assure you is first of all I have no orders, so nothing changed. But if I do get orders, I think it is important for you to know that we are still with the security forces,” Miller said. Separately, Afghan authorities Wednesday said they are considering postponing for several months the presidential elections that were originally scheduled for April 20. The announcement has triggered speculation the delay would support the U.S.-led effort to strike a peace deal with the Taliban that would lay the groundwork for a credible non-controversial Afghan election process.